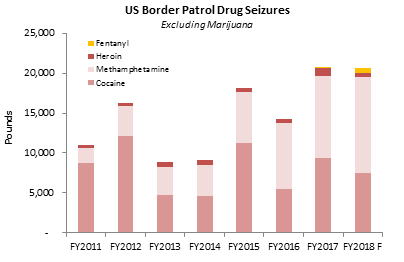 With all the vitriol expended on illegal immigration and the drug trade, it is worth noting that we are actually winning on an important front: marijuana smuggling from Mexico. Marijuana has historically constituted more than 99% by weight of drugs smuggled to the US from Mexico away from official crossing points. Marijuana smuggling to the US is down by 84% since 2009. Why the collapse? It is not enforcement. 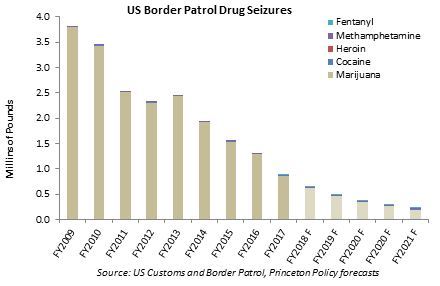 As the graph below shows, Border Patrol seizures of hard drugs have actually risen in recent years, most notably of methamphetamine and of small, but deadly, volumes of fentanyl. Instead, the collapse of marijuana smuggling can be almost entirely attributed to legalization in the US. From 1996 to 2012, nineteen states either decriminalized marijuana or permitted it for medical use. Since 2012, ten states have legalized recreational cannabis , interestingly, all but Vermont by ballot. Collectively, these measures have led to the creation of the organized marijuana production and processing industry in the US. With it, Mexican producers are being squeezed out. US marijuana is of greater potency and quality. As a result, smuggled marijuana volumes from Mexico are declining by 25% per year. With legal marijuana going on sale in Massachusetts in the coming months and legalization pending in New Jersey, Mexican exports will continue to decline. They will be finished off when Texas wakes up to the reality that its citizens are generating $100 million of marijuana tax revenues annually to the governments of Colorado and California. When Texas legalizes marijuana, it will make no more sense to smuggle pot than to buy a case of Corona in Mexico, put it in a backpack and lug it across the border in the hopes of selling it in the parking lot of a Houston Chevron. Those images of smugglers jumping the wall with backpacks of drugs will be a thing of the past, very possibly before 2025. That’s how we close the border to drug smuggling. Not enforcement. Not a Wall. We end smuggling through legalization and taxation. We can achieve the same result, the same way, with illegal immigration.